Blacklight Mushrooms. Too bad this wouldn't actually work under a blacklight. This is phenomenal, would you tell me how to make "The Enchanted Threshold" Blacklight sensitive? The only way I've been able to, is basically by copying the exact pigments from this image. You could try to do that with Photoshop. I love The Enchanted Threshold. I wish there was a more distinctive line separating day from night. Maybe a slight glow effect. Thanks very much. Gotta have neon colors! Thank you very much. With the bright colors, this remains one of my favorites. Haha, sorry, I stopped frequenting dev-art, so, seeing as it's now JULY, the time has probably passed, but, no problem. This is image is free to anyone. Sorry about that. Peace. Hehe cool. Thanks for the favs and comment. 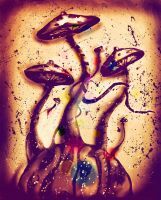 cool i loves shrooms~ awesome pic! Bright neon colors give me a positive energy feeling. Yeah. They sell a 6-pack of squeezable tube UV paint at Hot Topic for $10. You get all six of the 'common' colors. That is fun to draw with on black construction paper. I want to print this out and put it on the ceiling. It is too cute not to. Go right ahead. Thanks for the compliment . So awsome, I love the way my eyes react to it. Very groovy feel! Thank you, I feel the same. So many different neon colors blended together. Eye Candy. No two shrooms are alike .